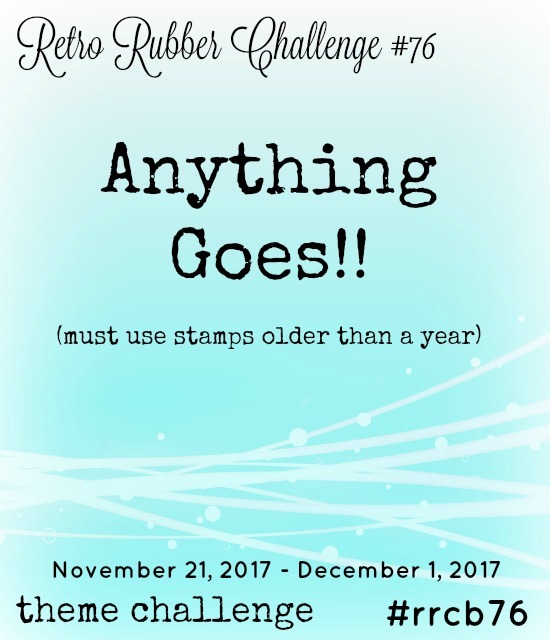 Today I have a card I made for Challenge 76 on the Retro Rubber Challenge Blog, which is an "Anything Goes" challenge. I decided to make a Christmas card using a stamp set called "Merry and Bright" that I bought from Gina K Designs....YEARS ago....and had yet to use! Unfortunately it is no longer being made but you can find so many other beautiful designs on her site! I started by adhering a piece of red cardstock to my top folding card base. I also cut a piece of white cardstock using the Stitched Rectangle die from the Stitched Shapes set (Simon Says Stamp). I then placed the Starlit Breeze die (Memory Box) across the cardstock and cut that die. Keep the stars that fall out for other projects. I wanted some glitter to show through the dots and stars so I pulled out some scraps of silver glitter (I am sure we all have some) and adhered them behind the dots and stars with double sided tape. I then cut a piece of white fun foam and adhered that to the back, covering all the scraps. Using a stamp positioner and come Onyx Black Versafine ink I stamped the hanging ornaments so that they looked as if they were hanging off the stitched stars and then I stamped the phrase "merry & bright" to the right of them. Next I colored in the ornaments with a light blue, red, and green Sharpie markers, adhered this to the card front and adhered 3 silver sequins to the card front. Here is a close up of the card front and the the full card again. Hello everyone! I hope everyone had a great Thanksgiving - if you celebrated the holiday. No "official" holiday here so we took off to the paper store so that I can stock up on cardstock and then to the mall to hit a new Japanese store that just opened, my favorite bookstore here, and then to Starbucks for more holiday cups. Today it is all about cleaning the house because we will have our Thanksgiving tomorrow with friends. So...what Black Friday bargains are you guys scooping up? Today's card is for a card swap I am part of. 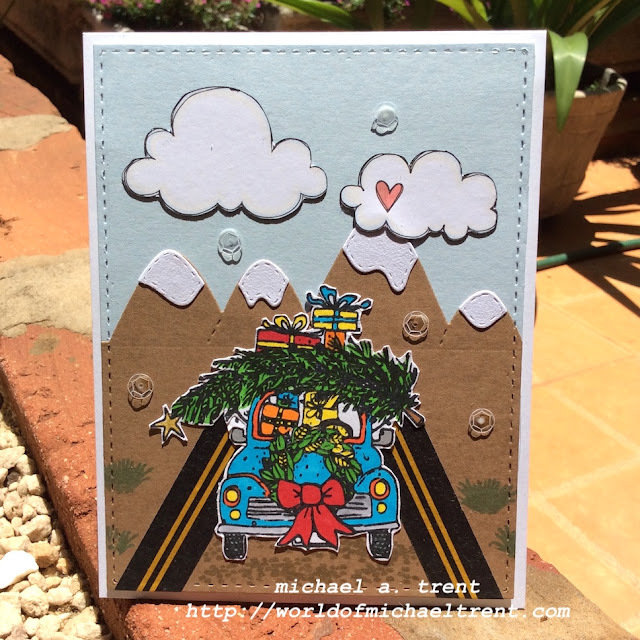 I had to make a card that had an image of a car with a tree on it. This idea was festering in my head but it came together pretty nicely! Plan on making a few more of these this week. To start off I (i) made a top folding A2 white cardstock base, (ii) cut a piece of light blue cardstock with the stitched rectangle die from the Stitched Shapes set (Simon Says Stamp), (iii) cut the Mountain Border die (WPlus9) out of Kraft cardstock and then I re-cut it again using the same stitched rectangle die so that the stitching would match, (iv) cut the snowcaps from the Mountain Border die using textured white cardstock, (v) stamped and colored the car from Love Bug Christmas (Unity Stamp) and (vi) cut a few clouds from a piece of scrapbook paper I had in my stash. Next, I adhered the snowcaps to the top of each mountain peak with a ZIG glue pen. Then I made my "road" using two pieces of washi tape in my stash that kinda looked like a road. Then I adhered this to the light blue cardstock. I also adhered the clouds with the ZIG glue pen. I found a stamp set in my stash with some small plants and rocks so I stamped them on the card front. I also cut a piece of fun foam, adhered it to the back of the blue cardstock and then to the card front. Then I adhered the car to the front, along with some clear sequins, and then stamped the sentiment inside! Hello everyone and Happy Thanksgiving to those of you that are celebrating!! I am thankful today for a lot of things. Since my first trip to Brasil in 2002 I have been witness to a lot of injustice in the world. I have witnessed families with small children living in a tent or under bridges, just steps from traffic. I have seen people digging through garbage looking for food to eat. The homeless situation here boggles my mind. Shanty towns line the highways in places - shacks built with pieces of metal or wood, no bathroom or running water - with families trying to live daily. When you see these things like this it is a constant reminder that things can be so much worse. So...that being said....I am thankful that I am not in a situation that I described and that I can try and be part of changing those injustices. I am thankful for Ruy, for family and close friends that keep me sane (you know who you are), a roof over my head, food in my belly whenever I want. I am thankful that Ruy and I can afford to keep 7 dogs off the street. I am also thankful for my readers and followers who keep coming back to enjoy the things that I create. I am also thankful for wine and Oreos! LOL Basically, I am just thankful for whatever I have right now and knowing that I really do not need anything else! Now...for today's project, which is another 3D "design team" project I made for Anthony's Paper Craft. They are having an amazing Black Friday sale too. 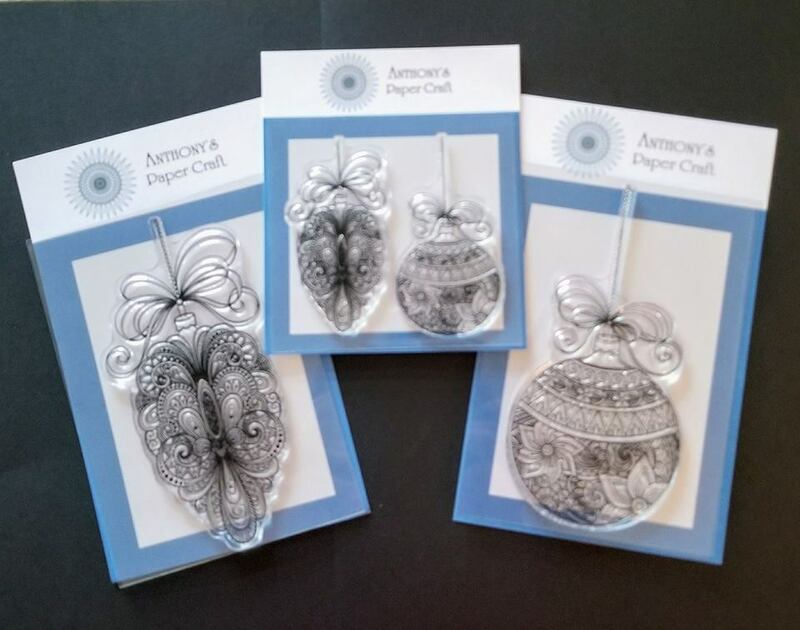 If you loved the 3D Ornament card I made HERE, this is a great deal for you. Details are below. when you purchase the 2 large ornament stamps you will receive the two small ornament set FREE (a $12 value). This offer may be combined with the Stamp of the Month and receive free shipping too. 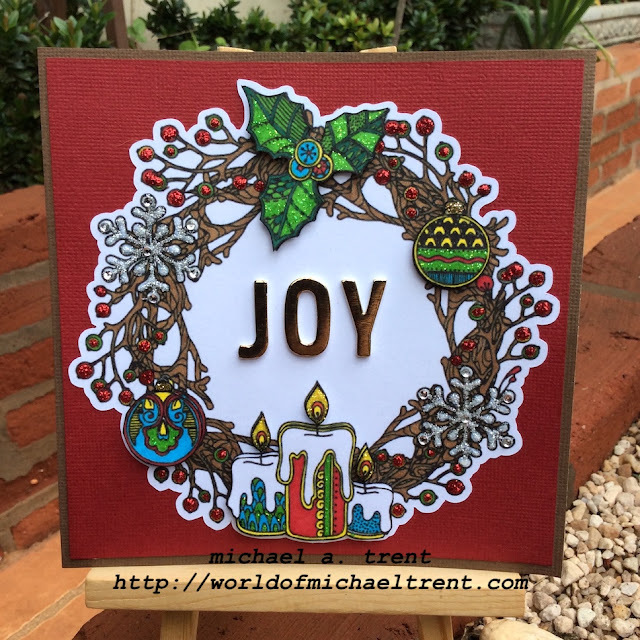 To make this 6" 3D Christmas Wreath Card I started by stamping Wreath 2 on white cardstock with Onyx Black Versafine ink. Then I scanned it and printed two of the wreaths on another piece of white cardstock - but larger than the original image. I find that working with larger images for 3D projects is more fun (and easier on the eyes). Then I had my Scan N Cut cut them out. I colored one of the wreaths in full with some fine tip Sharpie markers. It looks intimidating but, honestly, it only takes about 15 minutes. I used a light brown marker for the wreath and then red, green, blue, and yellow for the candles, holly leaves and the two ornaments. I also used applied a dab of Christmas Red Stickles to each of the berries and Frosted Lace Stickles to the two snowflakes. On the 2nd wreath, I colored the candles, the flames, the two ornaments, and the holly leaves. I then fussy cut them so that I can make them 3D. While the Stickles were drying I made my top folding 6" x 6" card base with white cardstock. Then I adhered a piece of textured brown cardstock to the card front. Once the Stickles were dry I adhered the wreath to a piece of textured red cardstock, 5.75" x 5.75", which I then adhered to the card front. Then I used the J, O, and Y letters from the Dear Lizzy Gold Foil Thickers and adhered them in the center of the wreath. and then adhered them to the wreath to give the 3D effect. And, lastly, because I always have to add just a little something....I added some Yellow, Gold, and Firefly Stickles to the flames, holly leaves, and ornament tops as well as some more crystals to each of the snowflakes. Now...I am done! I would love to know what you guys think of this card. I know it's not the type of card you make for everyone on your list but it is a beautiful card to make for someone special who might even frame it afterward. If this inspires you to make one I would love to see it! I returned home with two cups - a Tall and a Grande - and after I cleaned them I put them aside to be used down the road. But then I saw Kathy Racoosin's video on her Instagram page and I got inspired. You can see the video HERE. And you can see what she did with her 2016 cup HERE, and her 2015 cup HERE. Just follow her and subscribe to her blog The Daily Marker - it's totally worth it. After the Tall cup dried I took it apart. Then I cut and embossed the image using the largest die from the A2 Matting Basics B set (Spellbinders). Then I sat on the veranda with some Sharpie markers (and some jellybeans) and I colored the cup. I also used Copic markers for the various skin tone colors. I cut a top folding A2 card base of white cardstock and adhered a piece of red cardstock on top. I also cut a piece of white fun foam, adhered it to the back of the Starbucks cup, which I then adhered to the card front. I stamped the sentiment "Holiday Wishes" (American Art Stamp) on a piece of white cardstock that I cut out using a Stitched Circle die (Memory Box) and then I used a punch to cut the scallop circle of red cardstock, which I adhered over the Starbucks logo (sorry Starbucks). I added a few small crystals on the tree and some other areas on the card. I also found a metallic red pen that I ran over all the red areas on the card front to give it some shimmer. Happy Wednesday/Hump Day everyone! So....I have some exciting news!! A few weeks ago I got a Facebook message from Anthony Gilbert who owns Anthony's Paper Craft, a rubber stamp company in Cleveland, Ohio. He told me that he loved my work and asked me if I would like to be part of his design team. Um....YES! I have to admit, not having to apply for a design team because the owner loves your work - completely made my month! I am in the middle of making a bunch of cards for Christmas and Hanukkah and today's project is using the Round Ornament. 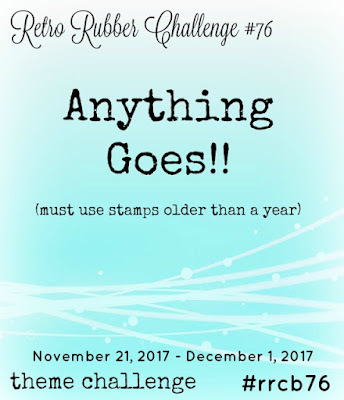 I fell in love with this stamp as soon as I saw it because it reminded me of my StenDoodle technique and I knew I would be able to use lots of color and make it 3D. Let me show you how it's done. I started by adhering a piece of decorative Christmas paper from my stash to my card front. Then I cut a piece of white cardstock using a stitched rectangle die. Now for a phrase...the other day I found a stack (trust me, a stack) of peel off stickers I had bought years ago and had never used. 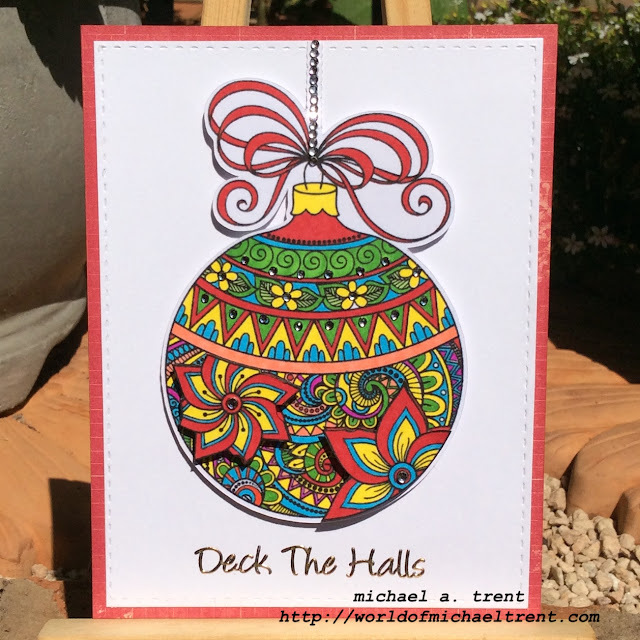 I found one from Magenta Style called Christmas Words Gold and decided to use the phrase "Deck The Halls" under the ornament. I then stamped the Round Ornament image twice on white cardstock. Because I wanted the ornament a little bit larger for my card front and I wanted to make it 3D, I scanned the image, printed two of them on white cardstock, and then cut them out with my Scan N Cut. Note: Although Anthony's Paper Craft does not have dies to match the images, many of them cut out beautifully with the Scan N Cut. Trust me!! Next...I colored!! One of the ornaments I colored completely using 5 Sharpie fine point markers - red, green, yellow, blue, and peach. For the 2nd ornament, I colored only the two flowers and then cut them out. Next, I put some pop dots behind each of the cut out flowers and adhered them to the ornament - giving a 3D effect. 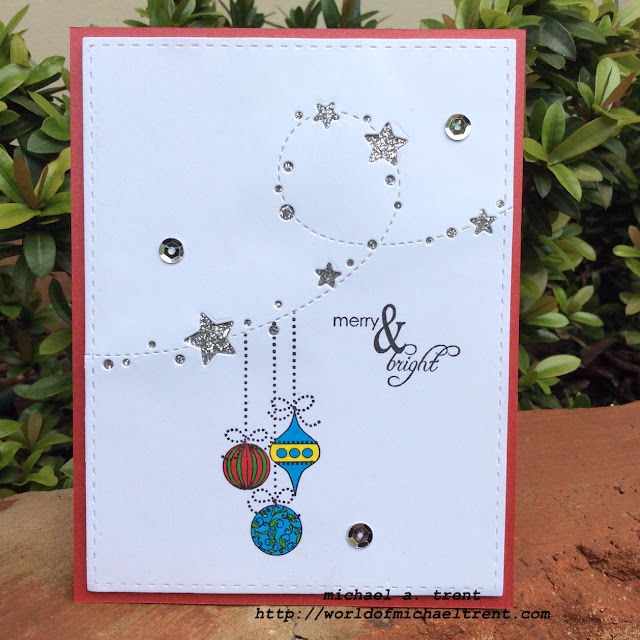 And, finally, the last few steps - I adhered the ornament to the card front by using pop dots behind the ornament and glue on the chain. Then I adhered some really small crystals to the ornament and the chain to make it pop. Hello everyone!! While I was putting away the Halloween stamps last week I found a small stamp set of leaves that I had never inked up and figured they would have to wait until next year. 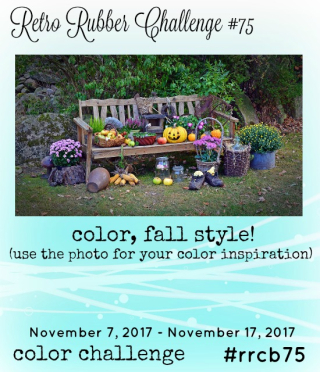 Then I saw this "fall leaves" challenge by the Retro Rubber Challenge Blog and had to go pull them out!! I started by stamping the leaves from Leaves (99489) (Inkadinkado) (circa 2009) onto a piece of a yellow post-it note to make a mask. Then I grabbed 3 of my Ombré inks (Hero Arts) in autumn colors - Light Ruby to Royal Red (AF319), Butter Bar to Orange Soda (AF309), and Ombré Autumn (AF366). I started by stamping the largest leaf in the Light Ruby to Royal Red ink on a piece of white cardstock, 3 5/8" x 4n7/8". I then placed the mask over the leaf and stamped the next leaves using Butter to Orange and Ombré Autumn inks. I continued masking and stamping until I had stamped the leaves across the whole piece of cardstock. I then put the cardstock in my Mistii (My Sweet Petunia) and stamped the word "gratitude" from Harvest Expressions (98555/Inkadinkado) with Onyx Black Versafine ink. Lastly, I made my card base. I started with an A2 piece of white cardstock. I adhered a piece of autumn colored textured cardstock to the front, then a layer of black cardstock with a stitched border, and then the white cardstock with the leaves. The final act was to adhere a few orange metallic sequins to the card front. Done!! I left the inside blank so it can be written on. I'm glad I finally got some ink on these leaf stamps. I think they are really beautiful with these "autumn" colored Ombré inks! I'd love to know what you think of the card. Let me know by leaving a comment below!